Are you ready for your internship? Do we have a place for you!! Disney is recruiting students who are doing thier internship in the Spring, Summer and Fall of 2019. 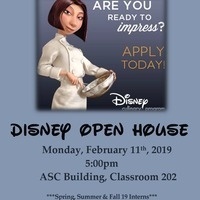 Please apply online at: www.disneyculinaryprogram.com and stop by the Experiential Education & Career Service department (103) to schedule your interview.